Here's a peek at this month's Copic class at Scrap 'N Friends. I haven't done very much in the way of wedding stuff, so here ya go. 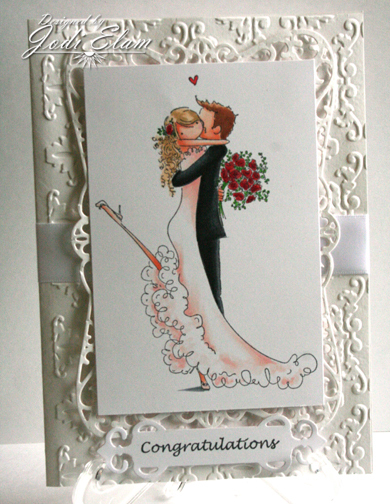 This card is a 5x7 using a Damask embossing folder by Darice, the stamp is Brenda and Brett Get Married by Stamping Bella, and the Spellbinder's die is Decorative Labels 8 - all available thru Scrap 'N Friends. Aren't they adorable? Class is Tuesday, May 14th at 12:30 or 6:00 pm. Colors used are as follows: E000*, E01*, E02*, E23*, E25*, E21, E51*, E53*, E55*, C5*, C7*, C9*, R000, R00, R20, R24*, R27*, R29*, G12*, & G14* (the * denotes we've used these colors before). There's still room to join us! Call 833-2600 and sign up. Beautiful card! I don't see a butterfly or fairy to let it qualify for my Flutter By Wednesday Challenge but I could be overlooking it. Hope to see you play along again soon!